when there's more than one in a photo. They all seemed to be taking a break at the same time. ,I am hard pressed to have one in a picture. I blame the dogs big feet! Fantastic! 4 all at once, lucky if I see 1 a week! Love it Flcrazy! Such stunning butterflies! Wow! When I went kayaking last week, I saw at least 10 resting in the mud along the river shoreline. Never have the camera when you need it! WQW!! that's wow with my tongue hanging out!!lol.... 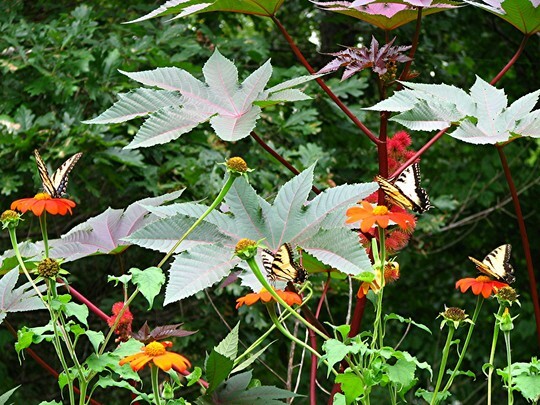 The Castor bean is getting huge...and all those butterflies at once! FANTASTIC!!! I know what you mean Lisa, the best shots always get away from us don't they, glad you like the pics ! LOL..., thanks Lori ! Yours will be getting this big before long, hang in there friend ! Lovely oasis of beautiful flowers .. so guess only the prettiest butterflies need apply , lovely. As my mom would say,"Beggers can't be chosey", so I'll take any butterflies I can get Bonkers....lol. Fantastic shot! I'd like to grow some Ricinus next year if i can get hold of some seed. I'll be more than glad to send you some Sid. They are always a treat to grow, they seem to grow 6 inches a night . It's been interesting to see the CB response to the week or two of hot weather... they just came to life... with the cloud and rain they were coming along...but as soon as it got hot ...they started to really move! Yes Lori, they really love the heat ! That's the only reason mine get so tall, they thrive in our heat and humidity. But I think they are just as pretty on a smaller scale. The leaves are large and shiny on this plant whether it gets tall or not.